Phew, what a week! While a lot of my friends couldn't wait for their kids to go back to school, there was much ambivalence about it at the MOE house. The routine of the school year is nice, but the end of vacation brings a boatload of heartache that I am never quite ready for. Especially for Sky. He still struggles to manage his sensory issues and to navigate the increasingly complicated social world that is school. The transition may have been a bit rougher this year because our break was so darn sweet. Thanks to Ren's bum back, we had a particularly relaxing vacation in which we didn't really go anywhere or do anything. This all but eliminated the stress that comes from trying to make sure the kids adjust to travel schedules, new beds, and people who don't know them very well. Plus, we didn't have to worry as much about their dietary restrictions because everything was already gluten and dairy free. My stress level was also infinitely lower because this vacation was the first time in a very, very, very long time that I was not writing a dissertation, desperately looking for a tenure-track job, or moving. It turned out to be one of the sanest, most relaxing vacations we've spent together. Did I mention they let me sleep until 8:30 four days in a row? That hasn't happened since at least 2004. Sure the kids were thrown by the lack of routine and the unavoidable changes in diet that come with the holidays (there were a few candy canes and cups of hot chocolate, not to mention all the marshmallows). By the time we started the second week of their break, though, we'd found a pretty good rhythm that combined as-much-as-humanely-possible time playing in the snow, special dates with Mommy, and tons of sensory play. Besides the sensory bins and play dough, we had numerous dance parties and obstacle course relays (that required them to jump, crash, punch, toss, and scoot). This past Monday and Tuesday, when the absolutely Arctic temperatures extended the kids' winter vacation by two more days, I was actually kind of relieved. A shorter week is always easier than a long one, especially when it's the first week back to school. But ever since they started back on Wednesday this week can't seem short enough. First there's the challenge of getting all three kids up, dressed, and properly breakfast-ed, lunches made, and coats (and gloves, hats, boots, and backpacks) on before the bus arrives at 7:20 (Did I mention the ongoing saga of the bus? If not, I will save that for another post). Second, actually, there is no second. Or third. Because in order to pull off step number one, I basically have to orchestrate EVERYTHING from the time they get home from school the day before until they set foot on the bus the next morning. And it's not easy, I tell you. 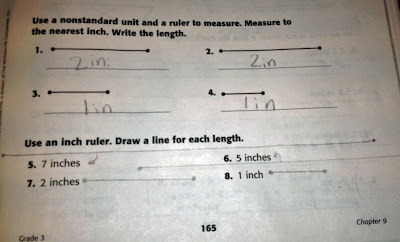 Take today, for example, within 15 minutes of returning home from school, Sky was engaged in full-blown sobbing and gnashing of teeth because one of the math problems on his homework assignment asked him to draw a line seven inches long, and THERE WASN'T ENOUGH SPACE NEXT TO THE PROBLEM FOR A 7-INCH LINE!!! 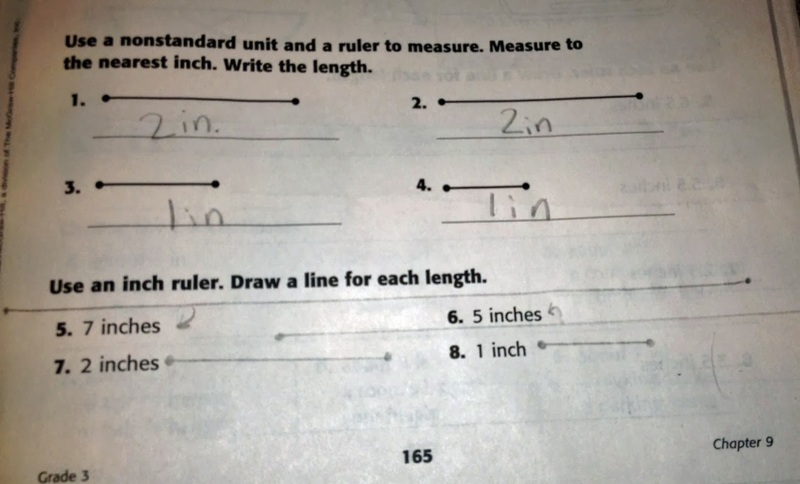 (For the love of God, have the people who created the workbook never met a kid on the autism spectrum?) When I suggested he use an arrow or somehow indicate his line was in the nearby margin, he looked at me as if I'd just suggested he remove his liver himself, cook it for dinner, and serve it with ice cream. "I can't DO that, Mom. I'll get in TROUBLE." So, we might as well be back to the first day of school because, this week anyway, Sky has resumed his obsessive worrying about possibly falling afoul of all the rules at his "new" school. He's back to being convinced that no one (especially not his teacher) likes him. And he's back to falling apart over all the mundane things like getting up early, riding the bus, and having homework. In other words, that relaxing vacation was just enough to undo everything we'd accomplished, and it kind of makes me never want to sleep until 8:30 ever again. *** If you're new here, you might be mistakenly led to believe that this is the first and only time our back to school transition has been difficult. Don't be fooled for a moment. Every dang time the kid goes back to school, he loses ground (at least at first). The only real insanity here is that I KEEP THINKING IT WILL BE DIFFERENT THIS TIME. (I'm beginning to think I might need to give these posts more creative names). This, my friends, it what I like to call "victory." Yes! There is no number 2. Ever. If I don't get all of their lunch stuff cleaned after school and backpacks coordinated the night before, we have NO HOPE of getting out of the house in the morning with any shred of sanity left. From the moment I get up until I go out the door to take R to preschool (L's already on the bus), it is one unending gauntlet of things to do. I look forward to going to work. it's so relaxing in comparison.